The Wurf Board’s revolutionary air-spring technology is the healthiest way to stand, but the Maui Wurf throws you a little extra curve! Special engineering and manufacturing enabled us to put a slight (not too much) curvature to the air-spring. This curve allows you to stand still when you want, but permits easy rocking for better blood flow, micro-muscle stimulation, improving work concentration. It's a great upgrade to an already great anti-fatigue board to boost your work focus and enjoyment. 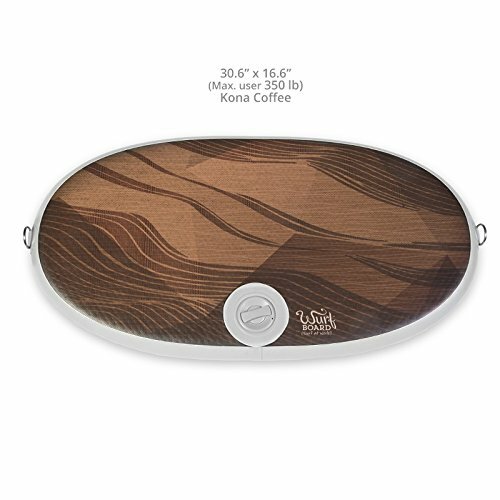 The Maui can be your body’s best friend while standing at work or home. Users have shared how it helps relieve knee, hip, back and sciatica pain. Made for impressive durability, the Wurf’s high tech, aerospace grade materials are engineered to outlast any foam or gel based mat. Highly supportive, fully adjustable air-spring mat with pump: tune it for your weight and performance needs. The Maui comes in three colors: Ocean Blue, Kona Coffee, & Dolphin Gray. Its anti-slip design lets you use the Board with or without shoes (no stiletto heels). The Wurf grips all types of flooring with applied weight — carpet, cement, wood flooring, etc. It’s light and easy to move with your feet when switching between standing and sitting, and is especially helpful for people who have difficulty bending over. Go to Wurf.com to see our library of over 160 at-desk exercises to help you burn up to 32% more calories than sitting. Wurf is designed for adults, but meets the toughest CPSIA standard required for children’s products, ensuring the safest materials are used in your standing mat. Wurf is designed and engineered in the United States by JumpSport, our founder/CEO invented the trampoline safety enclosure that protects millions of bouncing kids every day. With many award winning and industry leading products, JumpSport brings a focus on safety, quality, and performance to family fun and fitness! JumpSport is proud to be a USA family-owned business. Adding a curve to our lively-reactive surface encourages fun, rocking movements, boosts calorie burn and increases healthy circulation.